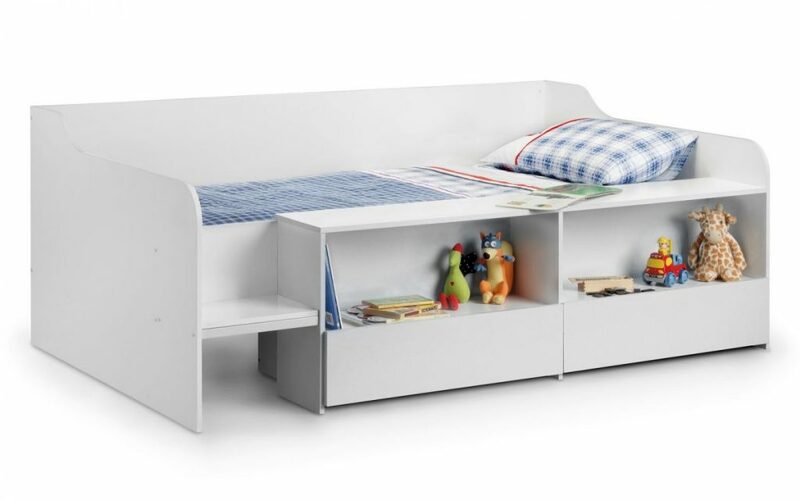 TOKYO 3ft Single White Low Sleeper Bed With 2 Drawers,Step & Shelves. The Tokyo Low sleeper has a clever design. Including lots of essential pieces of furniture all in one neat package, whilst saving on floor space. The perfect choice for smaller box rooms or to make your child’s room a little more interesting! The slightly raised bed fits a standard single mattress (190 x 90 cm), the mattress is not included but we do have some great recommendations. The Tokyo includes practical pull out drawers on castors and useful shelves. The space saving design is not all the Tokyo has to offer, it’s full of versatility, character and charm. This product has a quality feel with a choice of white & soft pink or white & sky blue. Ideal for both boys and girls. Your little one can really go crazy with their decorating theme! This low bed is going nowhere! The drawers have metal runners . Every detail and material on this bed has been thought about carefully to guarantee you a product that stands the test of play time. Also available in Pink & White Finish & Blue & White Finish. TOKYO 3ft Single White & Blue Low Sleeper Bed With 2 Drawers,Step & Shelves. TOKYO 3ft Single Pink & White Low Sleeper Bed With 2 Drawers,Step & Shelves.